I recommend Gauguin: Maker of Myth at Tate Modern Gallery to those ones who can enjoy and exhibition without questioning its feminist boundaries. For me Gauguin represents not only the movement to Primitivism but a deeper political break-up with the modern life, the Western culture and the conventional post-colonian pragmatism. 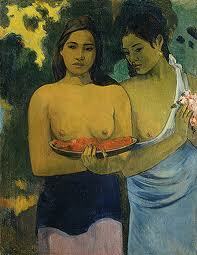 Gauguin knows how to transform the ‘different’ into ‘exotic’, the ‘other’ into part of ‘us’, the ‘local’ into ‘global’.